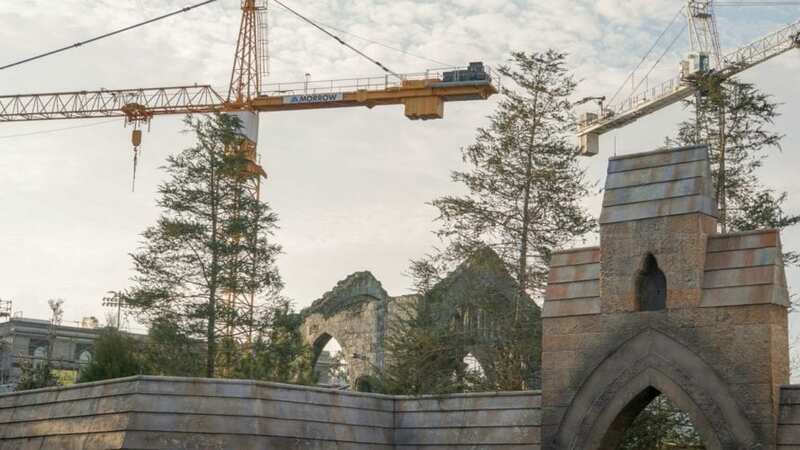 This conceptual art, originally posted by Orlando ParkStop, is our first true look at what the entire Harry Potter roller coaster is supposed to look like. We got a small glimpse at the theming in an official announcement from Universal Orlando back in October. This conceptual art aligns so well with current construction and rumors that we believe it is real. The first thing you notice in the art is the immense amount of greenery. This landscape seems to be dominated by grass, trees, and moss-covered buildings. There is also a lot of water around the track, much like we had guessed in November. This photo, by @Bioreconstruct on Twitter, shows that there is only one tower crane left in the construction site. These photos were taken just five days apart, with the most recent taken on Feb. 10. 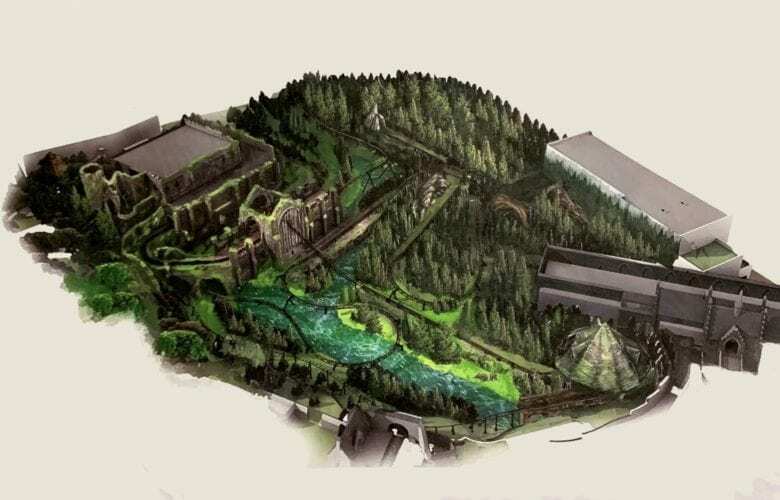 @Bioreconstruct also supplied us with in-park and aerial shots of the construction site to compare to the concept art. Hagrid is heavily rumored to be the main character for this Harry Potter roller coaster adventure. We spoke earlier on how the coaster vehicles will be themed to Hagrid’s motorbike and sidecar. It’s our assumption that the concept art was “overly mossed” for concept’s sake. With the lack of scaffolding around the hut, we are likely looking at a nearly finished moss-covered hut. This GIF showcases how closely the construction has stuck to its concept art. Like it was mentioned earlier, the green will not be as overwhelming as it is in the concept art. We can assume that luscious grass and trees will be added later to fill in the empty areas. On the opposite of the large ruins is a new body of water and the rumored location for Fluffy, the three-headed dog. Numbers 1 and 3 in the photos above are both water features that will surround the roller coaster. While it doesn’t appear the water will actually connect, the concept art makes it look as though guests will see this as one continuous body of water under and around the attraction. Number 2 shows where work is quickly happening on the cave that supposedly holds Fluffy. If this does end up being a Fluffy animatronic, like it has been rumored, this would instantly become one of the impressive pieces of animatronic equipment that Universal has ever pulled off. The most recent major Universal animatronic was King Kong in the Skull Island: Reign of Kong attraction, also found at Universal’s Islands of Adventure. The drop track building, even according to the concept art, will eventually be covered with a simple flat facade. It will not get an intricate exterior like the ruins or main show building. At number 1 in the photo above, this jagged rock underpass and accompanying trees will help hide the dead-end section of track that will take guests sky-high before they plummet backward. We also mentioned in December the possibility that the motorbike and sidecars could have the ability to spin 180-degrees horizontally to change the direction of the coaster. More on that in the next GIF. Looking at number 2, you can see workers at the rumored cavern covering for the Fluffy animatronic. We should expect to see heavy foliage here, along with a possible “go-away-green” wall to separate the nearby tracks. Number 3, a tree root structure around the 270-degree turn, has not yet taken shape and will most likely begin to form after the rockwork at 1 and 2 are closer to completion. Number 4 is the high-speed launch that guests will take as they fly into the large ruins structure. Now, back to the direction of the coaster vehicle itself. While it is possible that the motorbike and sidecar could spin 180-degrees at the top of the dead-end section of track, it seems unlikely that Universal would go to this effort for such a short backward distance. But, it is always possible the motorbike’s ability to spin could be more useful than we know. In this GIF, we point to the sidecar’s large wheel. So far, every photo we have seen of the coaster vehicle has had the vehicle going in the same direction. If this ever changes, we will instantly know that coaster vehicles have the ability to spin. This was the original entrance for Dueling Dragons/Harry Potter Dragon Challenge, the previous coaster that existed in this area. It is commonly thought that this will still be the entrance when the new Harry Potter roller coaster opens in its place. Thanks to the concept art, we can be sure that this will continue to be the entrance and main signage area for the attraction. 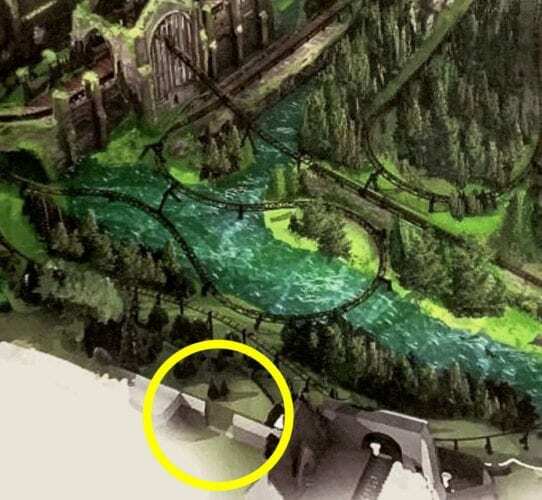 This is the only area in the concept art that has a wall with a hole or gap in it. It would seem logical that Universal would want to use the same general layout for their queue on this new attraction. Like always, everything stated so far is theory and guesses. Until it’s announced by Universal Orlando Resort, nothing is official.